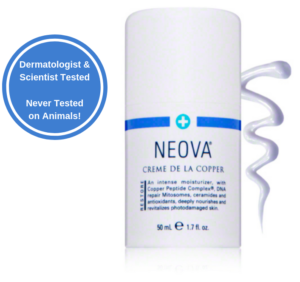 We are proud to announce we’ll be carrying Neova Creme De La Copper Advanced Skin Care! Rich in copper, this patented formula is created with the same DNA repair science that received the 2015 Nobel Prize in Chemistry. The powerful Copper Peptide Complex in Creme De La Copper penetrates through the skin’s barrier to provide visible improvements in moisture, wrinkles, texture, and firmness. Dermatologist and Scientist tested, but never tested on animals!